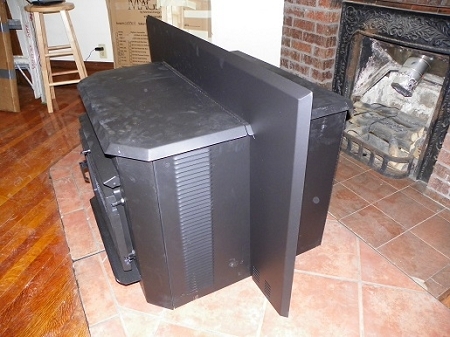 MATTE BLACK Unit Being Sold, Gold Door Option Availaable, NOW IN STOCK! 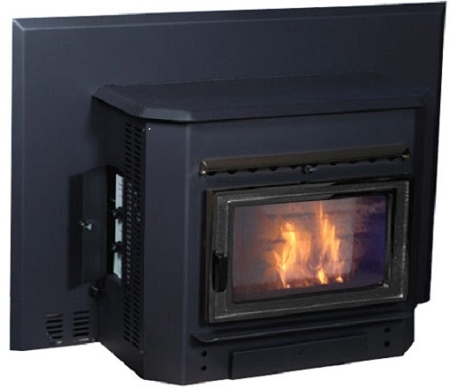 Introducing the BIG FIREPLACE INSERT BIOMASS BURNER, one of the LARGEST Inserts made, with a heat output 56,000 BTU/Hr for Wood Pellets and for Corn, and will heat up to 2500 Sq Ft. It has a HUGE Hopper Bin 75 lb which is much larger than the average insert size for a hopper bin. This auction is for a Matte BLACK, but a GOLD Door is available for $200 more (also in stock!) as an add-on option. Note that all Add-on Options will be paid in a separate Ebay buy-it-now transaction. 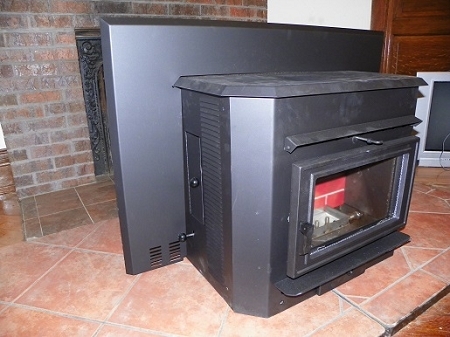 This is an unusual opportunity to buy a Fireplace Insert that is IN STOCK and can be delivered to you immediately after payment. Some of its features are: 24 Hour running, PILOT BURN when not calling for heat, , Corn Multi-fuel Capability, Agitator Bar in Fire Pot facilitating a CLEAN burn, Negative Pressure Burn, 10-Tube Stainless-Steel Heat Exchanger, Dial Electronic Controls, Thermostatic Control Options, Diagnostic Section in Operators Manual, Safety Shut-down Features, ASH Drop and Ash Tray, Clean Glass Air Wash System, UL and ULC Approved, EPA Exempt, Zero-clearance Capability.This unit is being sold at a DISCOUNT from the recommended Manufacturers Recommended Selling Price of $2,895. The Multi-fuel Conversion Kit that will enable it to burn Corn and other Multi-fuels. I has a ASH TRAY drawer that reduces the cleaning frequency...most other fireplace inserts don't even have one! The LARGE Hopper Bin in 75 lbs and you can adjust the fuel feed from 1 to 4+ speed. Manual draft DAMPER control (located on lower leftside) allows easy adjustment for fuel and draft conditions. It has an adjustable agitator Speed that turns in the fire pot, facilitating a CLEANER burn in the firepot. Negative pressure burn box prevents spillage of smoke and fumes into the house. Safety features include a top-load fuel system separating the burn pot and hopper bin thereby reducing the risk of burn-back (hopper fires!). Other Safety Features are automatic shut-off for out of fuel, shut-down due to malfunction. For power outages, we have a POWER OUTAGE Module available for you for $179. Digital Thermostat option avaialble for $72 and a Remote Control thermostat option is available for $265. There is a Diagnostic Readout for troubleshoooting. There is an effective air wash system that keeps the door glass CLEAN. 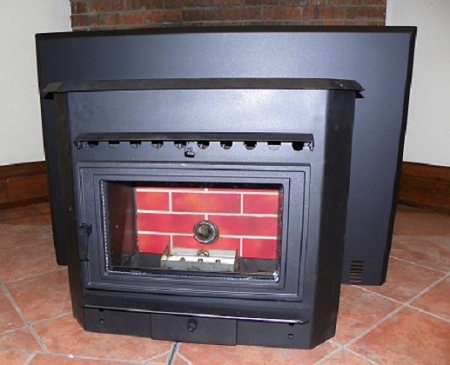 Note: There is a PEDESTAL BASE-MOUNT STOVE also available for the same price. It is certified and approved for residential and mobile home installations in both the USA and CANADA. This Fireplace Insert is also certified for masonry fireplaces as well as Factory-built Zero-clearance Fireplaces. The manufacturer's recommended selling price or MRSP for this unit is $2,895 but we are selling it at a DISCOUNT. Supplies are limited as we are keeping the warehouse inventory low for this heating season.